Data is the key to any nonprofit organization’s growth. It can help deepen relationships with supporters and provide valuable insight into how your organization can grow. Growth is dependent on your supporters, which calls for having a comprehensive system in place to effectively manage and track donor data. This can become difficult when your information lives on multiple platforms. To start, the process of importing and exporting data from various systems is time consuming. It also makes it difficult to get a well-rounded view of your donors and their history with your organization. And that makes it difficult to segment and personalize your communication with them. Fundraising software that integrates with your other applications makes this process much easier. The solution: find a platform that can gather all your online fundraising data into one place. Not only will this streamline operations, it will also help you balance your online and offline fundraising strategies. Still not convinced? Here are seven benefits to consolidating your fundraising platforms into one well-oiled machine. Many nonprofits use different systems for their email marketing, CRM, third-party event ticketing, volunteer management, analytics, and online donations rather than housing all this information in one place. The use of multiple systems forces you to manually export and import data across the different platforms, and keep track of each campaign separately. This is not only time consuming, but it can muddy your data and lead to errors. By entering all of your information into one system, data management becomes much easier and cuts way down on the risk of human error. It also makes your fundraising and communications even more powerful. Data that comes through your fundraising pages automatically transfers over, which can then fire off workflows in other systems to improve how you communicate with new and existing donors. An example of this is to tailor your messages in your email marketing software based on emails that come in through your fundraising page. During an event campaign, you can schedule specific emails based on supporters’ fundraising activity. You can create separate email series for first-time donors, monthly donors, and potential donors who attend an event. You can then set donors on the appropriate nurture track. The ability to see how supporters have interacted with you through various channels—all in one easy-to-use dashboard—is a valuable resource. This gives you a complete history of your supporters, which helps you to cultivate your relationship with them based on how they prefer to engage with your organization. In this example, you can see that a donor made two gifts in 2015. You can check which gift was bigger, which appeal they gave to, the date they gave, and their average gift size. After checking this, you can pinpoint exactly what should be included in your future messaging. For example, this donor made a gift after attending a Labor Day barbecue event. Your next message could inform them of another upcoming event. With this data, you can send targeted content and messaging to drive engagement to promote future giving. When data is spread across several platforms, you have to manually move the information to one place. This time-sucking, tedious work comes out of your budget and impacts your employees’ workday. It takes a lot of time to export data from your online fundraising platform and enter it into your CRM. Your focus then shifts from growing your organization to sustaining the organization. As with most things that require a manual process, the potential for human error can cause problems. With a sleek platform integration, the need to manually input data is eliminated. 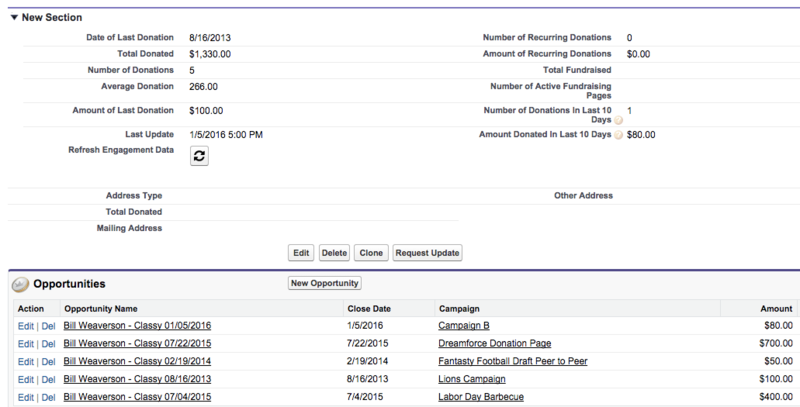 All of your online fundraising data and event pages transfer automatically into your CRM. This eliminates unnecessary work and prevents any donor data from slipping through the cracks. Now your employees can dedicate more time to the work that matters most: your mission. Centralized data doesn’t just improve your nonprofit’s communication with donors, but also your communication with your internal staff. By integrating your online fundraising platform and CRM, you empower your entire team to stay up to date on interactions with donors. Employees can see who is communicating with the donor, when they made contact, and what was discussed. This information can be easily accessed, no matter where the employee is or what department they work in. This transparency coordinates efforts across departments. For example, your marketing team may send a appeal email for your upcoming #GivingTuesday campaign. If other staff members at your organization can access this information quickly, this will prevent an employee heading a different campaign from reaching out to the same individuals for a donation at the same time, such as an end-of-year ask. Otherwise, your organization could appear disorganized and may turn donors off to giving. Unified data that is easy to access drives effective cross-departmental collaboration and action. Every employee can see the flow of communications with each donor. Remote staff members are kept in the loop, and different departments no longer need to waste time checking and re-checking with the team to ensure they are not targeting the same donor multiple times. According to Help Scout, “It takes 12 positive experiences to make up for one unresolved, negative experience“. Good customer service is more important than ever. Just one poor customer experience can lead to the unexpected demise of even the longest standing relationships. Customer service can improve greatly with the ability to read donor data quickly. Imagine a $10,000 donor calls with a question about an event they have agreed to sponsor. If the employee answering the question can’t access the donor’s giving history, they may offer a generic reply. The donor may leave the conversation feeling offended that they weren’t treated in a way that reflects their level of commitment to your organization. And worse, you may lose this person not only as a sponsor, but as a supporter. A scenario like this can make your organization appear uncaring and unconcerned with their donors. However, if you capture donor data in one accessible location, all staff members will be able to give better donor stewardship. Your staff can look up how much a donor has given, what appeal they gave to, who they’ve previously communicated with, and how they should be followed up with. This improves your customer service and shows your supporters that your team is unified. Most importantly, it makes your donors feel like they have a relationship with your whole organization—not just one person. Centralized data can also help you identify opportunities for larger donations. Accurate fundraising data can help you recognize those supporters who should be nurtured toward greater levels of giving. It can also help answer important questions such as, who are my top donors? Who were my top donors last year? Who are my top fundraisers? Which event did they attend? Insights from this data can help you identify a larger fundraiser with the potential to raise thousands of dollars for a similar campaign, someone who is primed for your recurring giving program, or a sponsor at an upcoming event. These opportunities can fall through the cracks when multiple systems are in place. When accurate data can be pulled in a timely manner, you are able to target the people you want to engage, encourage, and guide towards long-term giving. Growth is more than just fundraising a set dollar amount—it’s a package that includes changes to your company in terms of operations, staffing, facilities, and leadership. According to McKinsey&Company, “Companies that address their organizational weaknesses as they implement growth strategies give themselves a competitive advantage“. Just as you plan for when things go wrong, a plan should also be in place for when things go well. One key way to plan for growth is by streamlining your operations. Managing data across different systems is cumbersome, expensive, disorganized, and most importantly, it prohibits growth. As your organization grows, data must be unified in a central location that can scale with you. Integrating your systems allows you to fully understand your supporters’ behavior and actions, leading to deeper connections. It enables your team to collaborate more efficiently and eliminates manual processes. And the time recovered through these streamlined processes can be redirected to growing your organization, stewarding donors, and advancing your mission.